Logo, banner, social icons, website...so many links in your signature! But do your recipients really click there? 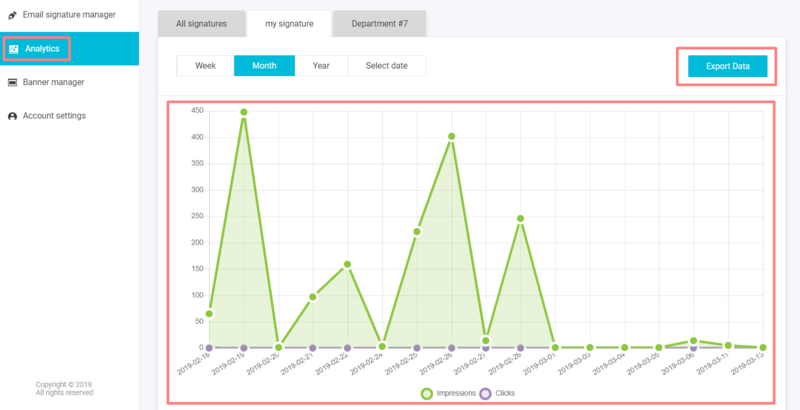 Analytics can provide you the data about the signature in each of your departments. Analytics is tracked by departments. Let's suppose you want to track data of both of your teams even if their signatures are the same. In this case, you need to put it in different departments to be able to see analytics separately. Below you can see how many times the logo/banner was reproduced - your impressions, clicks and CTR. CTR (Click-through rate) is the ratio of users who click on a link to the number of impressions. Make reports for your company using a chart or download a CSV file with the data. Your boss must be impressed! This information can give you insights on how effective your promotional campaign is or how you want to redesign it next time. Make your signature work for you!